"Not many Thai musicians can take the big step of releasing an English-language album on the international market. But for Slot Machine, their journey onto the global music scene has now begun with their recent launch of Spin The World on the international"
This album contains 10 English-language songs featuring the band’s unique modern rock blend of Thai and international sounds. The album was produced by Steve LilLywhite, renowned producer with a résumé that includes rock superstars like The Rolling Stones, U2, 30 Seconds to Mars and The Killers. Steve Lillywhite is known to only work with bands he believes in so it was a real coup for Slot Machine to have caught the super-producer’s attention during a live show in 2014. The band has already released two singles from Spin The World: ‘Give It All To You’ and ‘I Know, I Know’. The former is a mid-tempo, rhythmic rock song which incorporates instruments from the northeast of Thailand, while ‘I Know, I Know’ was simultaneously released with the Thai version called ‘Khon’ to immediate critical and commercial success. 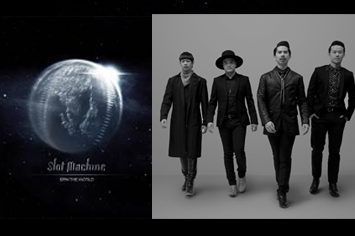 Slot Machine’s CD will be released in Thailand on 27 May, and followed in key Asian markets: Taiwan, Indonesia, Hong Kong and China.